When technology is squarely at the center of your business differentiation, trying to find ways to cut costs OUT of technology can be an arduous and painful process, to say the least. But that’s the situation that Boeing found itself in the middle of, looking to move resources to more transformative and growth-focused initiatives from their regular, “run-the-business” activities. To do it, they enlisted stakeholders from around the business and used their in-house strategy execution system (Decision Lens) and their in-house PPM system (CA Clarity PPM) to automate and accelerate the process. 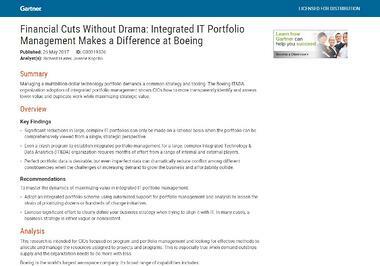 At the end of the effort, Boeing completely rebuilt their IT Portfolio Management process and found millions in opportunities for re-allocation. To document this impressive effort, Gartner analysts Richard Hunter and Joanne Kopcho embedded themselves with the Boeing team and observed (and participated in) all of the different steps and activities they put in place, including stakeholder engagement and initiative prioritization.The Garter case study, “Financial Cuts Without Drama: Integrated IT Portfolio Management Makes a Difference at Boeing” captures this process in great detail. Get a copy of the report here or at the link below. What stands out when you read the Gartner case study is that Boeing built an incredibly impressive team and process to solve their problem. They found benefits at all stages of the work, even when the data wasn’t “perfect”. For example, in the authors’ words, “Perfect portfolio data is desirable, but even imperfect data can dramatically reduce conflict among different constituencies when the challenges of increasing demand to grow the business and affordability collide.” Just getting STARTED with true, strategic portfolio management will have a huge effect on your process, your portfolio funding, and the benefits you see from it. Boeing started with a number of key business questions in mind, including “How do we align IT investments with Boeing's strategic direction and outcomes?”. They didn’t just attack a list of projects with a red pen, slashing projects and resources where it “looked smart”. Taking a strategic alignment approach using intelligent software solutions built solely for strategy execution made them confident that they would identify the RIGHT activities and resources to cut to ensure their strategy would not stall. And they proved that by combining strategy execution software with their existing people and existing PPM system, they could get the visibility into their portfolio AND their business strategy they needed to make the hard trade-off choices. It was certainly an impressive effort by Boeing that was very well documented by the Gartner team. How would you find the right opportunities for re-allocation when transformation and growth are on the line?